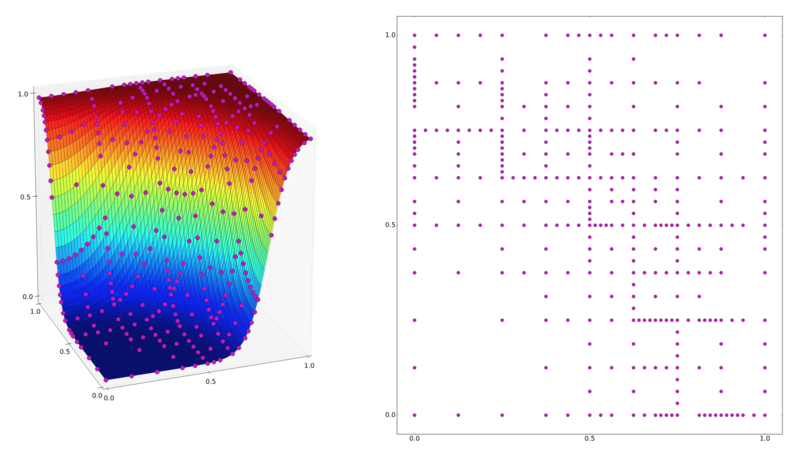 The Toolkit for Adaptive Stochastic Modeling and Non-Intrusive ApproximatioN is a robust library for high dimensional integration and interpolation as well as parameter calibration. The code consists of several modules that can be used individually or conjointly. The project is sponsored by Oak Ridge National Laboratory Directed Research and Development as well as the Department of Energy Office for Advanced Scientific Computing Research. Sparse Grids is a family of algorithms for constructing multidimensional quadrature and interpolation rules from tensor products of one-dimensional such rules. Tasmanian Sparse Grids Module implements a wide variety of one-dimensional rules based on a global and local function basis. Refer to the Manual for a complete list of the capabilities. DiffeRential Evolution Adaptive Metropolis (DREAM) is an algorithm for sampling from a general probability density when only the probability density function is known. The method can be applied to problems of Bayesian inference and optimization, including custom defined models as well as surrogate models constructed with Tasmanian Sparse Grids module. Refer to the manual for more details.